It’s never been easier to accumulate thousands upon thousands of frequent flyer miles. Finding a free seat to redeem them for? Not so easy. The process of locating and booking an [[Frequent Flyer Awards | award seat]] remains an exasperating one. Because airlines continually add and delete award seats from inventory—from 330 days before the departure date until the flight pushes back from the gate—finding a frequent flyer seat is a hit-and-miss process at best. While there’s no seat available at this moment, one may turn up later today, or tomorrow, or next week. The only way to know is to keep checking back with the airline, day in and day out. Most people have better things to do with their time. Generally, where there’s a problem, there’s a business opportunity. And this is no exception. 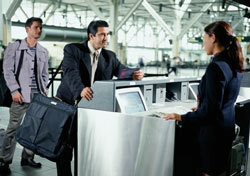 Last week, Yapta.com extended its airfare alert service to include frequent flyer award seats. Sign up to receive an email notification when the price drops for tickets on a chosen flight, check “include award tickets,” and you’ll receive an email letting you know when an award seat becomes available for booking. For now—the service is still in beta—Yapta only provides frequent flyer alerts for five airlines: [[Alaska Airlines | Alaska]], [[Continental Airlines | Continental]], [[Delta Air Lines | Delta]], [[United Airlines | United]], and [[US Airways]]. Monitoring of more airlines is promised. There’s no charge to use the service. Before there was Yapta, there was ExpertFlyer, a significantly more robust award alert service that tracks not just award availability but upgrades, and for 21 airlines rather than just five. There’s a price to be paid for the added functionality: $9.99 a month, or $99.99 for an annual subscription. Is it worthwhile paying the fee? Maybe. Of the 21 airlines monitored by ExpertFlyer, only six are U.S. carriers: Alaska, American, Delta, [[Frontier Airlines | Frontier]], [[Northwest Airlines | Northwest]], and United. So for those who are focused on domestic carriers, and are looking for free tickets rather than upgrades, Yapta’s free service may be all they need. For those with more complex needs, ExpertFlyer is worth a look. While any service that shines a light on award availability is welcome, Yapta and ExpertFlyer raise a question that I have yet to see posed: Why don’t the airlines themselves provide award alerts? They are clearly in the best position to monitor their own seat availability, and they certainly have the technology to send email advisories to members of their programs who are waiting for a flight to open up. To do anything less amounts to shirking their responsibility to their best customers.